GONE glamping yet? Nothing quite sets up a few crowning Instagram shots like going hiking in a new wave of ultra-luxe nature reserves. Fresh from a multimillion-dollar facelift is Alila’s Ventana Big Sur, set in a lush redwood grove in California. Multiple trails and spots spiderweb through the forest, some commanding a view of a 20-acre canyon. There are, of course, full resort and suite options as well. You don’t simply put up the four figures per night without prepping for the daytime itinerary, though. 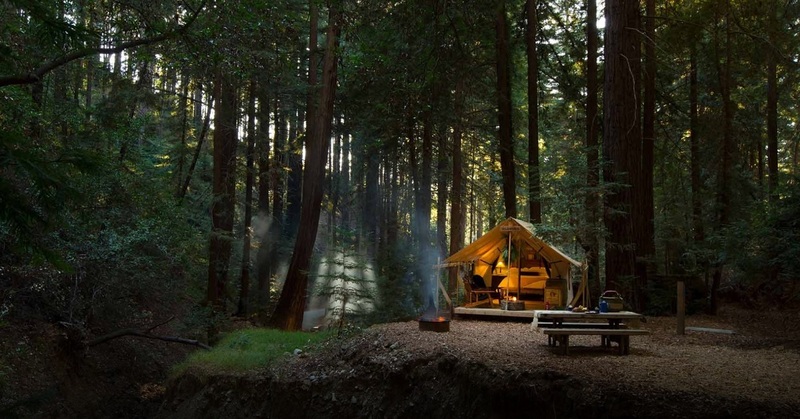 Here are five essential bits of gear that you’ll need on every glamping trip. Basics first – look the part with activity-appropriate clothes. Even Bear Grylls doesn’t let ruggedness stand in the way of good fashion sense. This is where Loewe comes in clutch with its latest Eye/Loewe/Nature collection kits you out with hiking essentials; parka, boots and all. Our full review here. We do, however, recommend full-length pants on all but the gentlest of glamping locations. You don’t want the stray nettle or startled insect getting a free pass at your exposed calves. Most glamping routes include access to running streams fed by mountain spring water, from which hikers can (supposedly) safely partake. Make doubly sure with a Lifestraw Steel. The award-winning produt filters out nearly all nasty bacteria and parasitical organisms, which could otherwise wreck a very costly trip. For those who don’t want to get up close and personal with a stream – you’d be passing on a killer Instagram shot, by the way – opt for the bottle formats. Some glamping itineraries come with some form of outdoorsmanship training, while others leave guests to their own devices. In either case, there’s no better opportunity to impress your companion(s) than with a massive, all-purpose toolset that can fillet, cut and hew while popping open bottle caps and assisting in navigation. Swiss army knives used to be trusty compatriots on such trips, but these keycard-sized kits from SOG – which fit into your back pocket – are just as essential in urban environments, making them a great pickup. Unless you’ve opted into a complete digital detox, you’re going to want some longevity on your devices – particularly if you’re relying on phone GPS to cover long distances. Let’s also not pretend that you won’t be pausing for photo opps. Indispensable, then, are the likes of a Beartwo Solar Charger, capable of refuelling an iPhone 4 times even while regenerating by hanging from a carabiner on your backpack. These hardy, water-resistant and shock-proof units also double up as flashlights. Leave your regular one at home! Pick your bag of choice based on how coddled you’re going to be on your trip. If you’re on a guided glamp, you can probably get away with a snazzy man-bag; consider Dior’s saddle bag or a cross-body from Zegna. These afford you maximum style with serviceable space. (Left) Dior’s iconic saddle bag, 2020 FW Collection. (Right) Ermenegildo Zegna’s Pelle Tessuta cross-body bag, crafted from thin nappa yarn. If you’re out for the full hiking experience, we’re not going to lie – you’ll want impossibly light, heavy-duty rucksacks like these ones from Colorado-based brand Osprey. These all-weather bags are engineered to take the strain off your shoulders and back while remaining breathable and hardy.